Revolutionize the way you power your projects with Flexy, the all new Tangle-Free Electrical Extension Cord. Save Time, Space & Money with Flexy! Saves you time! 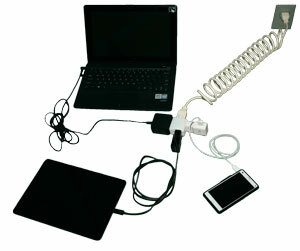 No more untangling, winding, and unwinding cords, like with flat extension cords. Time is money! How much time are other cords costing you? Safer! No more danger of tangled cords or when using hedgers and saws. Great for kitchen, bathroom, garage & outdoors. Saves space! Neatly stores in drawers, tool box, & kitchen cupboards. No more messy tangled cords. Soft coil pull! Will not pull out of socket when extended to great lengths. Proudly Made in the USA! 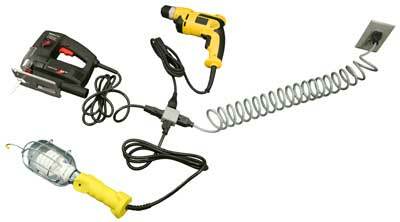 Get a high quality Flexy extension cords while supporting jobs for Americans. Stretches from 5 inches to 10 feet. Connect up to 3 devices at a time. Safer: Stays out of the way while using cutting or winding tools and appliances. Saves Time: No more untangling, winding, and unwinding cords. Compact Storage: For storing in Tool Box or Home Drawer. Soft Slinky Pull: Helps Prevent Accidental Pullouts. Stretches from 4 inches to 8 feet. Simultaneously Charges 3 Mobile Devices! Compact Storage: Neatly stores in drawers, tool box, & baggage . No more messy tangled cords. Saves Time No more untangling, winding, and unwinding cords.